I currently own the Wahl family home and am very familiar with the stories. I am restoring the home to the 1860’s era but it will take a while. The ice-house and some of the out buildings were on my property. Any time I dig in my yard, and down by the river, I pull up tons of artifacts, etc. So much so that I don’t even bother with shards of glass, plates, etc. as they are everywhere. By the river you can still see limestone foundations, tons of metal, (iron) re-enforcing rod that can be seen in one of the 1905 photos of the destruction, and much more. Several years ago, the Monroe Archeology Society did a test dig and we found the foundation of the ice house/office and more. Apparently, the majority of the ruins were buried (what was not hauled out or re-used – supposedly the house to the west of mine was built from the bricks of the main brewery building). Cutting the grass is a challenge due to sink holes and pockets of collapse from piles of debris, etc. On December 5th every year, I look out the window that John Wahls’ nephew supposedly did when he noticed flickering orange lights on his ceiling. Keep fire extinguisher on hand just in case. FYI – from what I understand and I believe was in his obit, John Wahl came from Canada/upper state New York and was a mason by trade. Apparently he built St. Michael’s Church and then bought the brewery in 1862 or 63 from Herman Mathis. 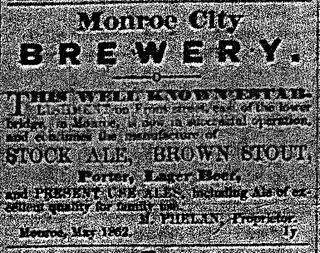 I have a photo copy of a Monroe directory in 1859 that has “Herman’s Brewery – O’Brien Street – A large stock of lager and beer always on hand” – or something close to that. Additionally, I believe there was a fire in the complex in the 1870’s but it was repaired and the massive brick structure was built.